ST. GEORGE — Strong southern winds and powerful gusts are expected to impact highway travel until Tuesday evening in Beaver, Iron and northern Washington counties. The National Weather Service in Salt Lake City issued the wind advisory Monday afternoon warning drivers of travel difficulties resulting from south winds of 25-35 mph with gusts in excess of 50 mph. See effects of high winds on vehicle illustrated in the video in the media player top of this report. 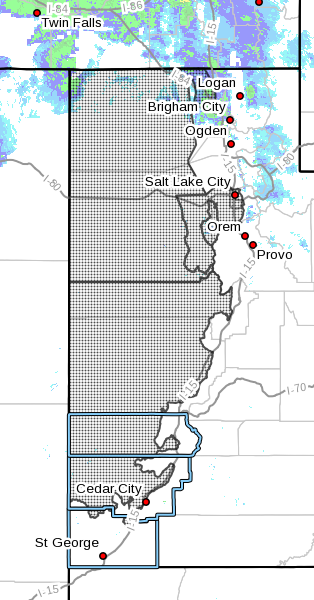 The advisory affects the western valleys of Utah including Salt Lake and Tooele Valleys, Great Salt Lake Desert and Mountains, West Central Utah and Southwest Utah. Cities affected include Salt Lake City, Tooele, Wendover, Snowville, Delta, Fillmore, Beaver, Cedar City and Milford. Winds will strengthen Monday evening and remain strong overnight and through the day Tuesday before diminishing Tuesday evening. Strong crosswinds will affect east-west oriented routes including Interstate 80 across northwest Utah, and Highway 50 across west-central Utah. Sustained wind speeds of at least 31 mph or gusts of 45 mph are expected. Motorists in the advisory area should be prepared for sudden gusty cross winds which can make driving difficult. The event in the video displayed above occurred Feb. 7 near Elk Mountain, Wyoming, on I-80. Three Wyoming state troopers were on scene providing care for motorists who were involved in previous crashes. All of the troopers were out of their patrol cars assisting others at the time and were not injured. “All we ask is that you please follow high wind advisories and closures when you are traveling … even if you plan to travel at reduced speeds. Hopefully this video illustrates why,” reads a statement on Wyoming High Patrol’s Facebook page.